A full spectrum, high potency multivitamin and mineral formula containing ideal levels of iron and zinc and plant source antioxidants. Contains only amino acid chelated minerals for maximum bioavailability. Timed release formula ensures that water soluble nutrients are available to the body throughout the day. Does not contain carotenoids or vitamin D as these ingredients contain gelatin and lanolin respectively. 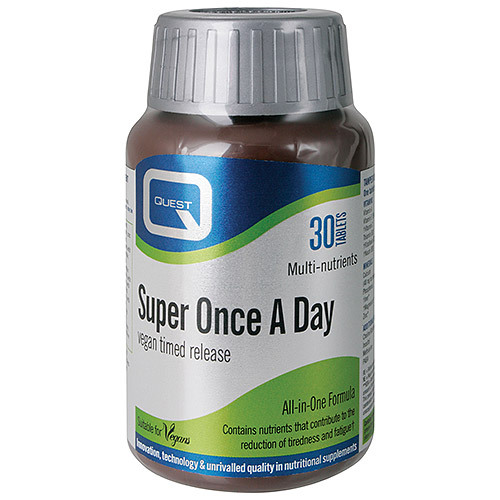 Why use Quest Super Once A Day Vegan Timed Release Multivitamin? Helps even healthy people meet their nutrient requirements. Suitable for vegetarians and vegans. Does not contain vitamin D, beta-carotene or mixed carotenoids as these preparations contain ingredients unacceptable to vegans. Dicalcium Phosphate, Multimineral amino acid blend (providing calcium carbonate, magnesium oxide, ferrous sulphate, zinc oxide, manganese carbonate, copper sulphate, potassium iodide, sodium selenite, chromium chloride, sodium molybdate complexed with citric acid, glycine, rice flour, rice protein complex, sodium hydroxide, sodium citrate, aspartic acid and maltodextrin), Vitamin C (with hypromellose), hypromellose, Non-GM soy lecithin, Vitamin E (natural source vitamin E from non-GM soya), Pantothenic Acid, Vitamin B6 (with methyl cellulose), Riboflavin, Niacin, Choline Bitartrate, Thiamin (with methyl cellulose), DL-Methionine, Inositol, Para-Aminobenzoic Acid, Magnesium Stearate, Citrus Bioflavonoids, Lysine HCl, Vitamin A (with antioxidant: tocopherols and tricalcium phosphate), Betaine HCl, Vitamin B12 (with dicalcium phosphate), Biotin (with dicalcium phosphate), Papain, Rutin, Cysteine, Folic Acid (with dicalcium phosphate), Tablet coating (hypromellose, Colour: Titanium Dioxide, Stearic Acid, Bulking agent: Microcrystalline Cellulose). This product contains iron which, if taken in excess, may be harmfull to young children. Keep out of reach and sight. Long term intakes of this amount of B6 may lead to mild tingling and numbness. Below are reviews of Super Once A Day - Vegan Multivitamin - 30 Tablets by bodykind customers. If you have tried this product we'd love to hear what you think so please leave a review. Quest Super Once A Day Vegan Timed Release Multivitamin is a full spectrum, high potency multivitamin and mineral formula suitable for vegans. Timed release formula ensures nutrients are available to the body throughout the day.